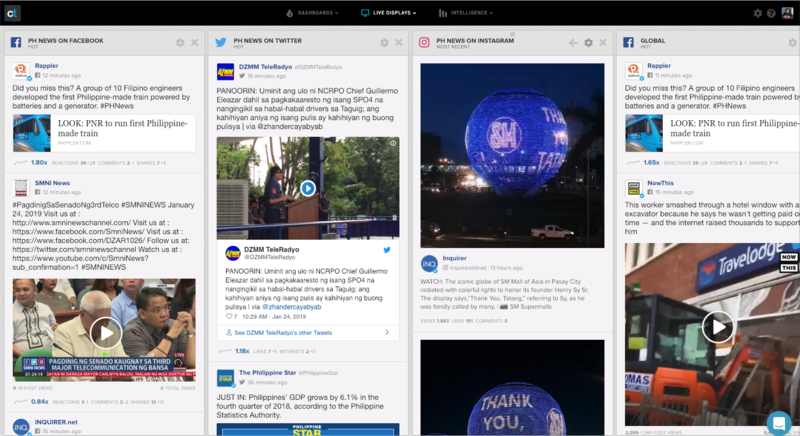 We've seen a lot of partners using CrowdTangle's Live Displays to ensure everyone in the newsroom knows what's happening and trending on social. Some of you share the URLs to your team members while others project the Live Display on a screen. You can also use these on air in broadcasts with touchscreens. If you need a refresher on how to build Live Displays, you can check this guide. 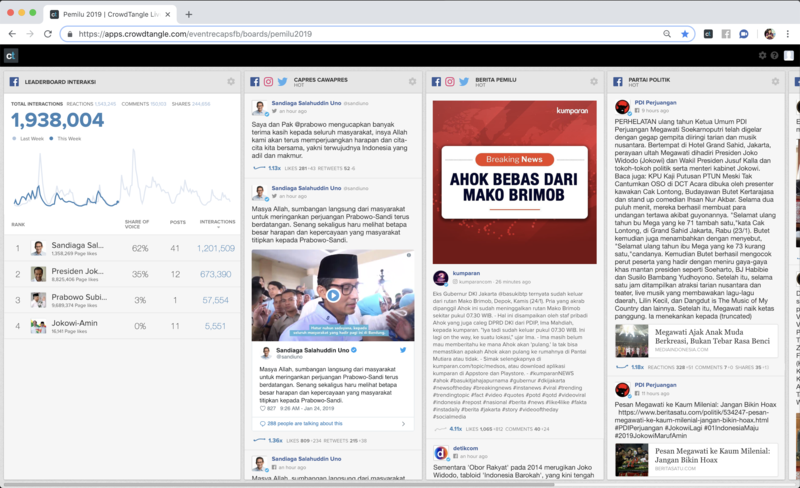 With a number of elections happening around the world in the next couple of months, some of you have asked how you can use Live Displays during debates or discussions especially when you want to highlight some user reactions or engaging posts from candidates. Here's an example of a live display on air from KompasTV in Indonesia. Create lists for accounts you want to track and saved searches for known issues and hashtags. Use the filter to limit or exclude results from a certain group. If using in an election debate, you can limit the results to show only candidates' posts if you want to focus the show's discussion on their statements or exclude candidates' posts if you want to discuss reactions from viewers. Select a few topics to focus on. You don't need to put all lists and saved searches at once. If a debate is expected to focus on two issues, pull the lists and saved searches related to that. You can update it for the next debate when you know what other issues will be discussed. 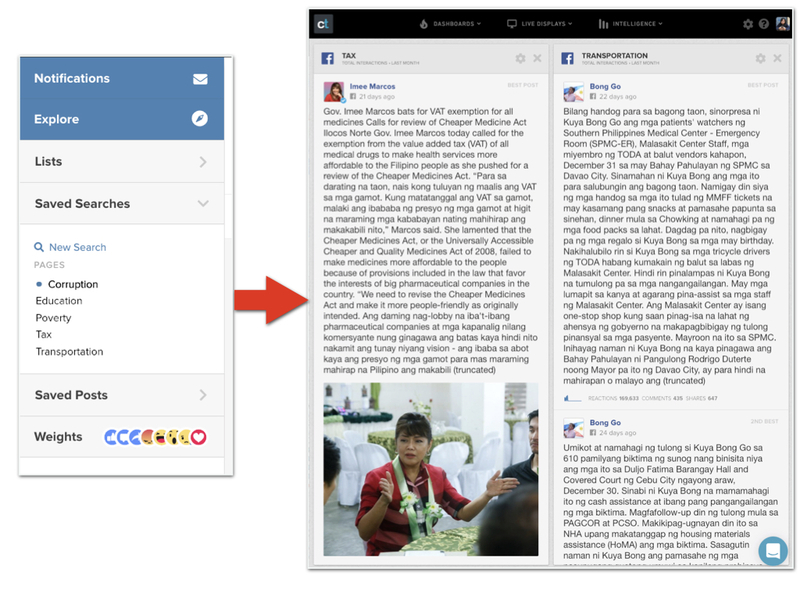 Update your lists and saved searches as new keywords and hashtags emerge. It's best if you have someone dedicated to updating the hashtags you're tracking and looking at new keywords and topics that are emerging from the discussion. When the lists and saved searches are updated in the dashboards, the live displays are automatically updated as well. Identify the keywords that are not safe for broadcast or against your standards. You can exclude these keywords from all your saved searches so a post that includes those words won't appear in the live display, even if it's overperforming. Expect posts from your competitors to appear in Live Displays, so make sure you're comfortable talking about those posts. 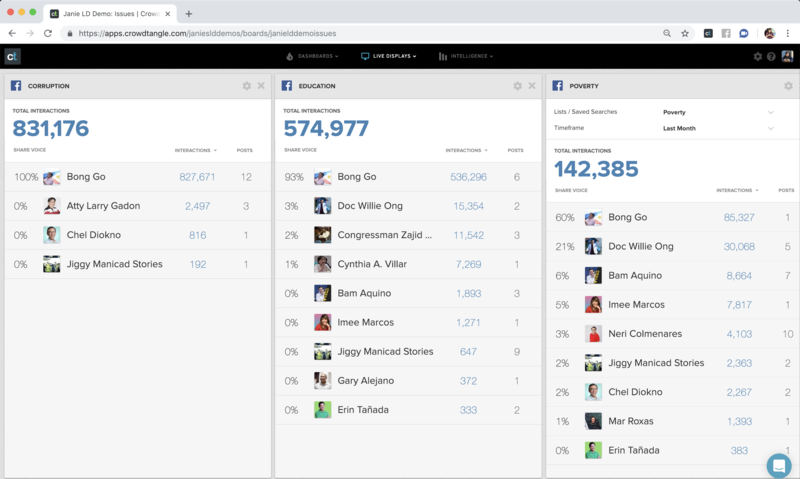 Show pages or accounts within a particular list (group) getting the most engagement, create a leaderboard and pull that list. Show pages or accounts getting the most engagement on a particular topic or hashtag, create a leaderboard and pull the relevant saved search. If you want to limit the leaderboard to a select group of accounts, you can search within a particular list. Show keywords or topics getting the most mentions and engagement, create a search leaderboard by selecting the All Saved Searches option. (Only your CrowdTangle SPM can do this, so reach out to them if you need it).